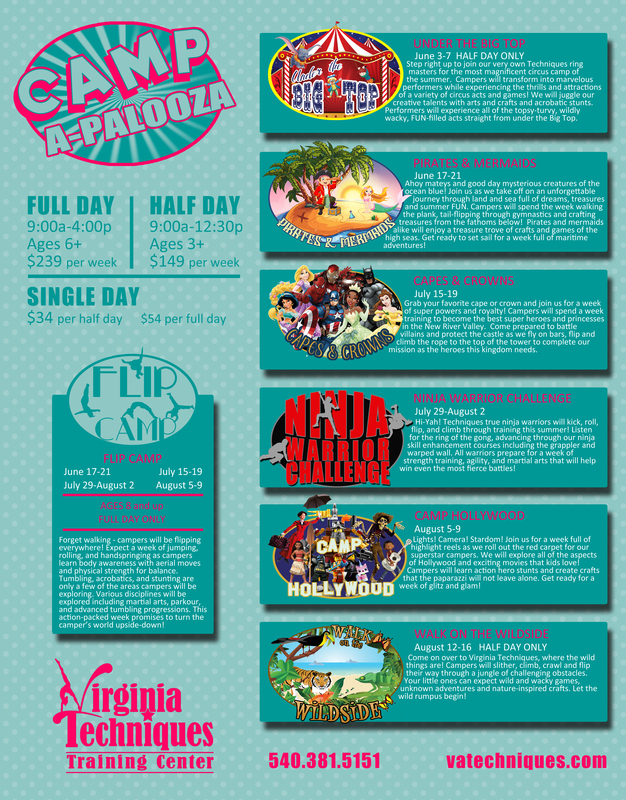 We offer the best themed summer camps in the NRV! Our camps will take your children on imaginative adventures that may include training as super heroes, explore the magic of Hollywood, sailing the sea with pirates, or entering the royal castles with a princess. We offer half day, full day, and pay-per-day options that include top-notch gymnastics instruction, arts and crafts, special guests, obstacle courses, games, and more. All full week campers will receive a free camp t-shirt and everyone will perform in our Friday show. At the conclusion of the week the fun will include sliding down the inflatable slide, a pizza party, and performance for parents. Our camp directors and coaches love working with children! Their supervision will ensure your camper has fun while making new friends and trying new activities. Registration opens March 1st. Make sure to sign up early, as camps fill up quickly.